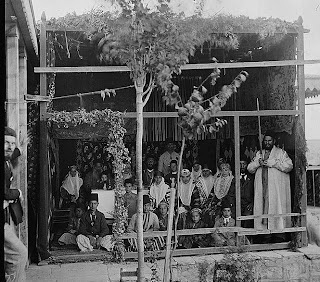 Picture a Day - The Holy Land Revealed: How a Family Celebrated Sukkot in Samarkand in 1870; Is This the Same Family in Jerusalem in 1900? Is This the Same Family in Jerusalem in 1900? Israel Daily Picture usually focuses on the Library of Congress' American Colony collection of 22,000 photos. But while exploring the Library's archives we came across an amazing collection of pictures of the Bukhari Jewish community of Samarkand in 1870. View more pictures and a history of the Samarkand Jews here. Members of the community began moving to Eretz Yisrael, the Holy Land, in the mid-1800. They established a new neighborhood outside of Jerusalem's Old City walls. View pictures of the Bukhari Quarter here. The American Colony photographers recorded how various Jewish communities celebrated Sukkot in Jerusalem in the early 1900s with pictures of Yemenite, Ashkenazi and Bukhari sukkot booths. View the collection of Jerusalem celebrations of Sukkot here. Is it possible that the family photographed in Samarkand in 1870 may be the same family photographed in Jerusalem in 1900? Click on the caption to view the original photo.